Announced today, the GF250mm F4 R LM OIS WR is a telephoto prime lens for the Fujifilm GFX 50S, and the seventh lens in the series for this digital medium-format camera. In 35mm-equivalent terms, the lens provides a focal length of approximately 198mm. With a construction made up of 16 elements in 10 groups, including one super extra-low dispersion lens and two extra-low dispersion lenses, the lens promises superb image quality no matter what the shooting distance. It’s also equipped with powerful built-in five-stop image stabilisation, an especially useful feature for the GFX 50S, whose resolution will make camera shake very obvious. While the GFX 50S is unlikely to see too much use as a speedster, Fujifilm has also promised silent and high-speed autofocus for those who want it. Minimum focusing distance is 1.4m, and it uses a 9-bladed diaphragm. Constructed from magnesium alloy, the lens body is sealed in 18 different places, providing protection from dust and some weather-resistance. It’s also freezeproof down to -10°C. 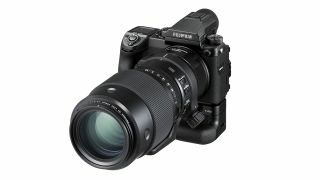 If the reach isn’t quite sufficient for your needs, Fujifilm is also launching the GF1.4X TC WR, a 1.4x teleconverter that bolsters the lens’s focal length to 350mm, or approximately 277mm in 35mm equivalent terms, the trade-off being a one-stop reduction in maximum aperture. Fujifilm promises that the high quality of the teleconverter should result in minimal reductions to image quality. Alternatively, if you’d like to get closer to your subjects, Fujifilm has also announced 18mm and 45mm macro extension tubes (MCEX-18G WR and MCEX-45G respectively). If you want to get your hands on all of this kit, it’ll be available at the end of May 2018. The GF250mm F4 R LM OIS WR lens is priced at £2,899/$3,299, while the 1.4x teleconverter can be yours for £749/$849.95. Visit Fujifilm's website for more information.